A mystery cyclist beat the Strava times set by professional riders on Box Hill and a number of well-known climbs in Kent and Surrey at the weekend. Identifying themselves as ‘JP’ and controversially using a photo of Lance Armstrong in the Tour de France yellow jersey as their avatar, the rider took on three laps of a circuit of Box Hill on Saturday, October 12, and beat the mark set by Madison-Genesis professional Ian Bibby during the RideLondon Classic road race in August. On their fastest lap, they ascended Box Hill at 19.5mph. 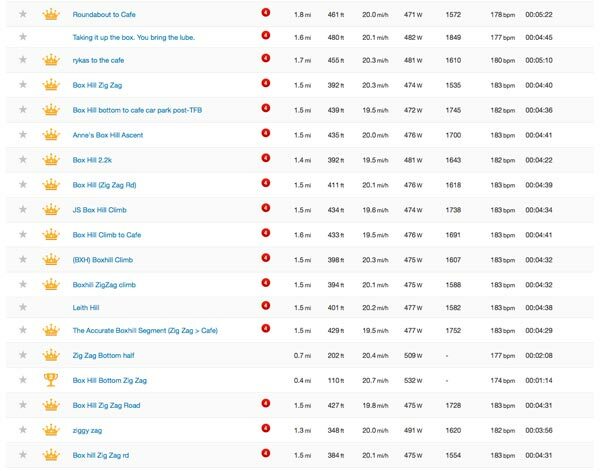 In all, ‘JP’ set a total of 18 King of the Mountains records for the various Box Hill segments – well, until someone flagged their ride, meaning that their times now did not appear on the segment pages. On Sunday, ‘JP’ turned their attention to a rain-lashed Kent to put themselves at the top of the leaderboard for Toys Hill and Ide Hill, two well-known climbs to local riders. On Monday, they headed west to Swindon and took the Uffington White Horse and Inkpen Hill segments in Wiltshire but fell short on a number of others. And Tuesday’s ride features a loop east of Swindon, with yet more KoMs in the bag. The latter two rides have since been made private or deleted. Speculation as to the identity of the super-fit hill-climber has been rife – even more so as their home residence is stated as being Aspen, Colorado, USA, which happens to be second home to Armstrong. The account was originally created under the name Leeroy Jenkins, rather than JP, in reference to a long-running World of Warcraft gaming joke featuring a character than runs in and annihilates everything, ruining everyone else’s game. Quite apt. The only other piece of evidence is their bike – listed as being an Ax Lightness Vial, a superlight, super-expensive model that costs just under £13,000. The rumours were compounded by the presence of several top international riders in the London area over the preceding week. Could one of them have strapped on a Garmin and had a cheeky couple of rides on the hills? There have also been a few, perhaps less generous, commentators suggesting that the rider’s GPS mapping has been ‘doped’, using a tool such as ride manipulating website Digital EPO which allows you to increase the average speed of your ride. 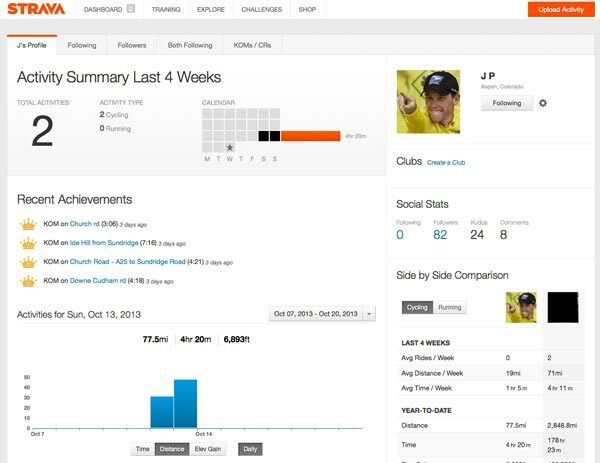 Manipulated ride data makes a nonsense of times set on Strava’s segments. You could feasibly bumble along on your gran’s shopping bike at 5mph, upload your data to Digital EPO, select your desired speed and watch the KoMs tumble in. However, an artefact of using Digital EPO is that it introduces spikes of speed into your data, and JP’s rides do not have these spikes. Cadence and heart rate data is also present, and both sets are as they should be for a fit rider doing those efforts. The presence of cadence and HRM information also dispells the theory that they are doing it in a car or on a moped.